Hello blog friends. I seem to have made a mistake and tried to edit this blog post from many years ago (back in 2013) and it posted again with the comments. Has this ever happened to any of you? Well, I guess I am posting this again. 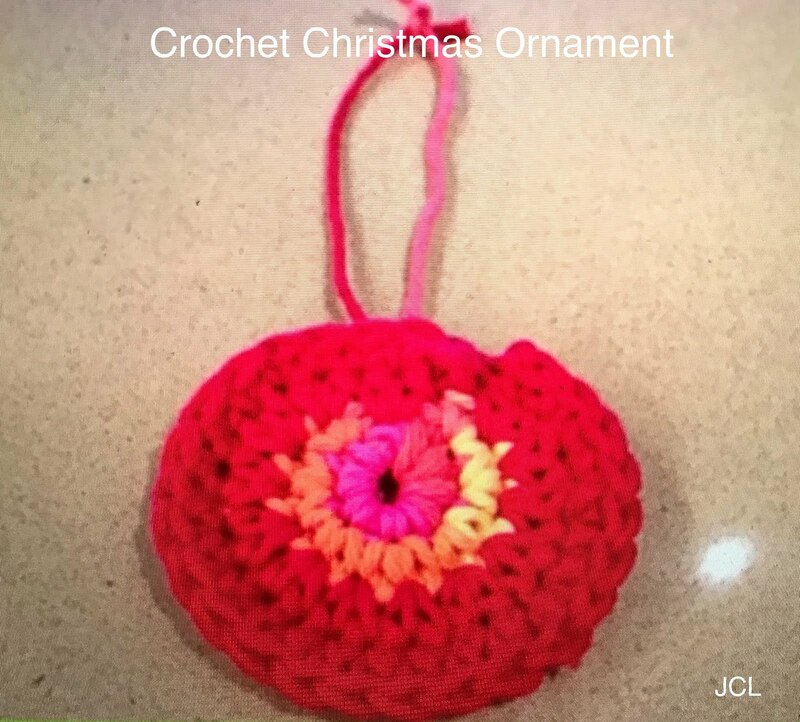 Perhaps some of you would like to make this fast and cute Crochet Christmas Ornament using any leftover scrap yarn that you might have. Christmas is right around the corner and how would you like to make your own Christmas Ornament? I've made and designed a really easy pattern for a Crochet Christmas Ornament that can be made in one one sitting. This is a great way to use up any scrap yarn that you may have left over from another project. For this pattern I used kitchen cotton, but you could also use acrylic yarn if you don't have any cotton yarn available. Please Note: This pattern is written in US terminology. Please try out this fun ornament to make for your Christmas tree and get a start now before the rush. So pretty in shades of red; perfect against the fresh greenery of a cheery Christmas tree! Thanks for sharing! Hi Julie, nice to meet you. It's always fun to meet fellow crocheters and see lovely things they make. I think it's a good idea to start preparing for the Holiday Season in advance. Love your ornament. Thank you for sharing the pattern. Hi Olga, welcome to my blog and thanks for your sweet comment. This is lovely. Would give an old time Christmas feeling. Warm and cosy feeling. Hi Angel, thanks for your sweet comment and welcome to my blog. Very pretty :) Thank you for sharing at the Link & Share Wednesdays party! Thanks Tracy for your support and I enjoy your link parties! I really wish I knew how to crochet. I have tried several times but I am just not good at it. It took me a lot of practicing and looking at youtube videos and maybe they would help you. This would be cute in red and green too. :) I love crocheting but I havne't made any ornaments for my tree yet. Hi Christy, yes you could use any color combo! Your blog is so cute, and what a cute ornament. I need to start working on my ornaments for this Christmas. Found you Submarine Sunday. Thanks for stopping by the blog today! 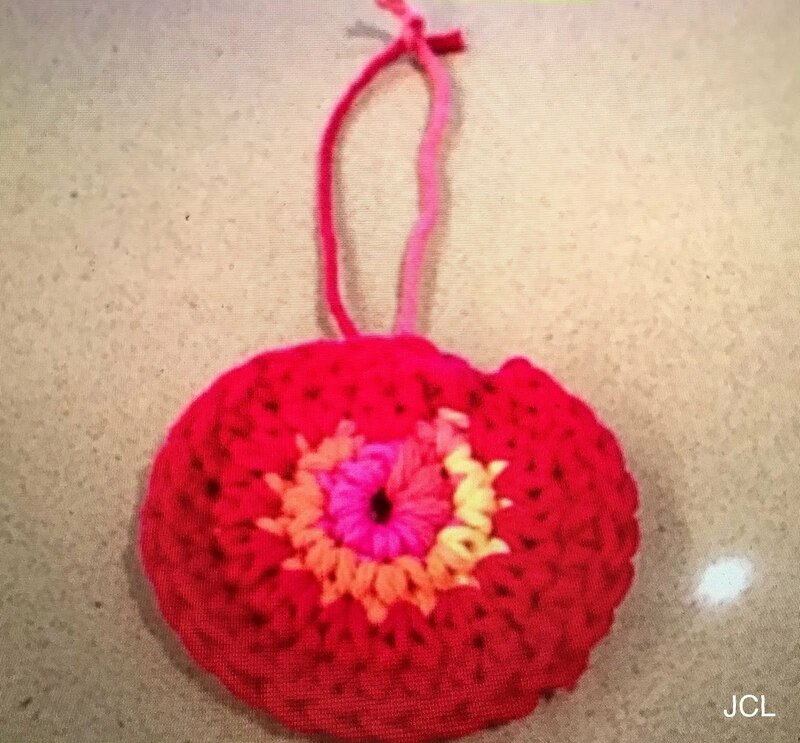 This ornament is super cute, Julie! Hope you enjoy the Banana Bread! Hi and thanks for the recipe and thanks for your sweet comment. Oh Yes, Christmas will be here before you know it. This is so pretty, I need to get back into crocheting while we are on the road. This would be a perfect project. Thank you for sharing on Tuesday Trivia. I pinned it. I used to crochet a lot at one time but I seem to not have enough time any more. Hopefully, some day, I will go back to it!! This is a great way to use up my extra yarn. I love this too and it might be something I can try to make! Thanks! So cute Julie. Love the colors. I saw it on Instagram and loved it. It's cute as can be and a fun way to invest in your decorations. They always mean more when you make them.